It's snowing in Indy and I am in love! The first snow is always the best...you know, before the sludge and black ice set in :).To tell you the truth, I needed this snow. Growing up in the Midwest, snow is inevitable, but when and how much, is always a gamble. Today, however, we won big; the kids are filled with joy and excitement as each fluffy snowflake lands on their jackets. From snow angels to snowball fights, laughter filled the air. My heart warms as I stand in silence and witness the world change to a Winter Wonderland. The cold, crisp air is invigorating, and for a little while, in the ciaos of daily life, I find peace. Yes, the first snowfall is without doubt, magical. Today, I bring you pt. 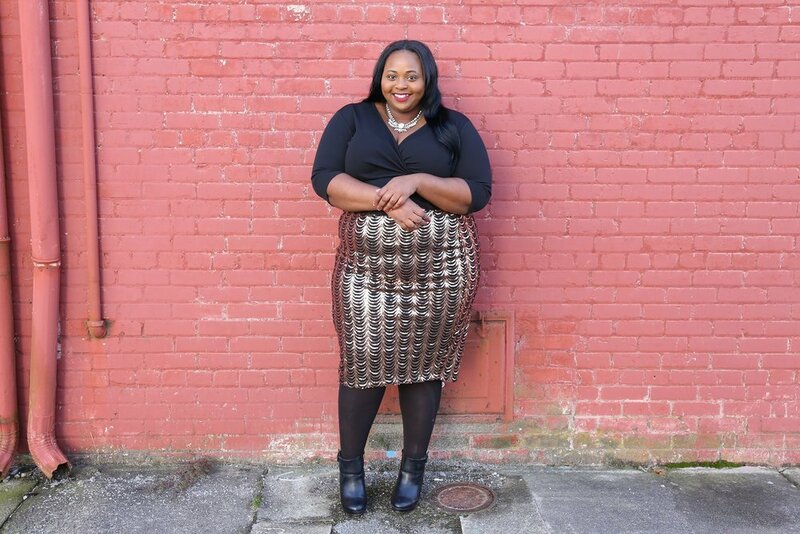 2 of the Holiday Lookbook Ashley from Simply Curvy and I put together for you! My look of choice: Holiday Family Fun! This look is effortless, which is a necessity during the busiest time of year. Adding a little flair to everything I wear is always the plan, but when I talk family, I talk comfort and chic. A great oversized knitted sweater and leggings seemed perfect for a family appropriate look. Whether it's going to the park, attending outdoor holiday festivities or just snuggling on the couch...this combo is a win-win. Texture is sooo in this Winter. Play with different fabrics, and colors! I usually go for bright, bold colors, but couldn't walk away from this frayed, pom-pom'd greatness. Would you feel comfy, but chic in this look? Make sure to check out Simply Curvy's page to see the final look of our Lookbook Series!